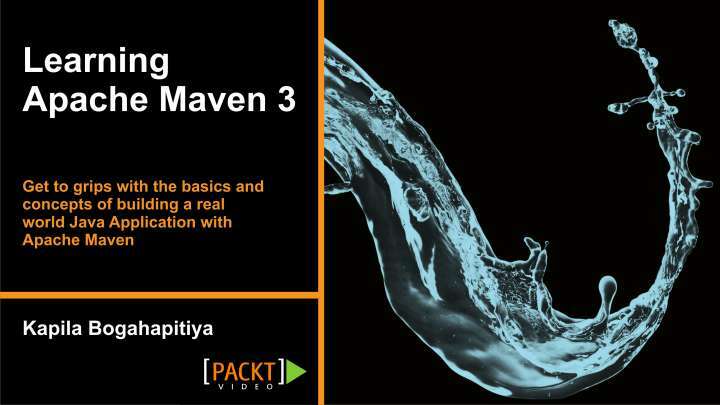 Today I want to propose you the review of another interesting Packt video training: Learning Apache Maven 3. As per all Packt video course you can decide to watch it directly online with video streaming or download the full pack (approx 400Mb) to watch it offline. As usual all video code is available for download as well. Second section go straight to application creation using maven archetypes, creating them from command line and then importing them in the IDE. Then a Unit test is introduced to manage automated testing of such application with maven testing functionalities. After these two quick samples we go more in deep with Core Maven Plugin usage, build process Lifecycle, Repositories, Super-Pom concepts. All this concepts introduce the more interesting chapter of the course: Maven Web Application. In this chapter Maven usage will be applied to generate in Web application in a quick way, integrating it with Tomcat application server. After this preliminary step we will perform another deep dive into core dependency management functionalities, understanding their usage, best practice, managing exclusion and optional dependencies. Back to our application we will then add the Spring + Struts2 framework to our project to provide a full presentation/business logic layer and Hibernate libraries for database persistence. I consider this (and next) chapter the core of the whole course since it show how to create a full MVC compliant java web application using some state-of-the art frameworks in few minutes. Final chapter is dedicate to multi module project and we will rearrange our previous application using a WebService client-server approach, separating all different components in a separate maven module and refactoring our code to move to a full WS. Summarizing my impression on this course is that it efficiently completes the previous video training. The first one was a pure-maven concepts, while this new course put the light on the real maven usage: creating application skeleton and full test-driven and ready-to-deploy build environment. All maven benefits are immediately clear even to maven newbies who are shown how introducing maven can drastically speedup their everyday work pushing developers to best practices.